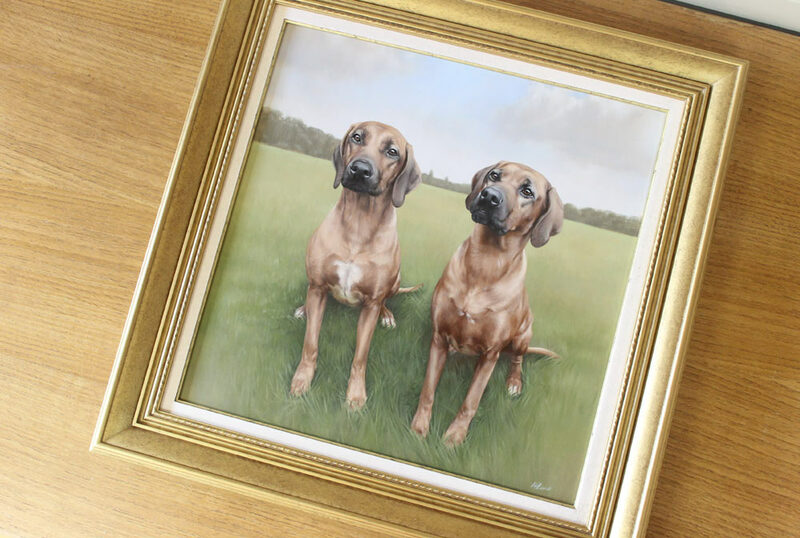 Welcome to Nicholas latest Rhodesian Ridgeback Oil Painting. This portrait will be a very special surprise for our clients wife as a birthday surprise! 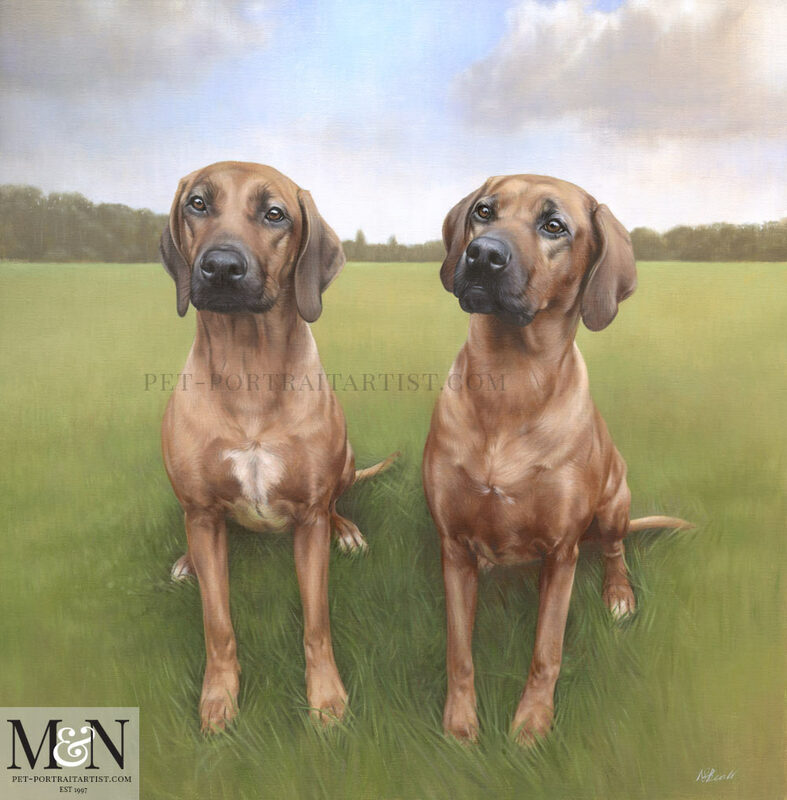 The Rhodesian Ridgebacks are called Maddie and Amber and the portrait is a traditionally hand painted oil on Italian Linen canvas in fine grain at 21 x 21 inches. We worked closely with Neil in taking just the right photos for the portrait. Neil had a few photoshoots with his dogs and eventually came up with the perfect pose for both dogs. The dogs were photographed in our clients garden, however Neil wanted them to be in a landscape setting. We used a photo of the dogs while they were out on a walk in a field for the background. This is where they love to run free on their daily walks, so it was perfect for the painting. Nicholas has enhanced the sky from the original photo, adding some beautifully painted clouds and blue sky. Isn’t the colour of the sky fantastic! Nicholas has created a beautiful painting here, both Amba and Maddie are stunning and it really feel as though they are happily sitting in the field ready for their walk. The overall colour scheme of the painting is very relaxing and calming and light seems to emanate from the centre of the painting coming forward to the viewer. This also centres our eyes on both dogs. I love the way Nichols has depicted the soft grass around their feet in the Rhodesian Ridgeback oil painting. As the grass heads back into the center of the painting it recedes nicely into the distance with less detail, bringing your eye up to the trees behind. The trees don’t show too much detail either otherwise it would take the viewers eye away from Amba and Maddie. The background is there to compliment them. 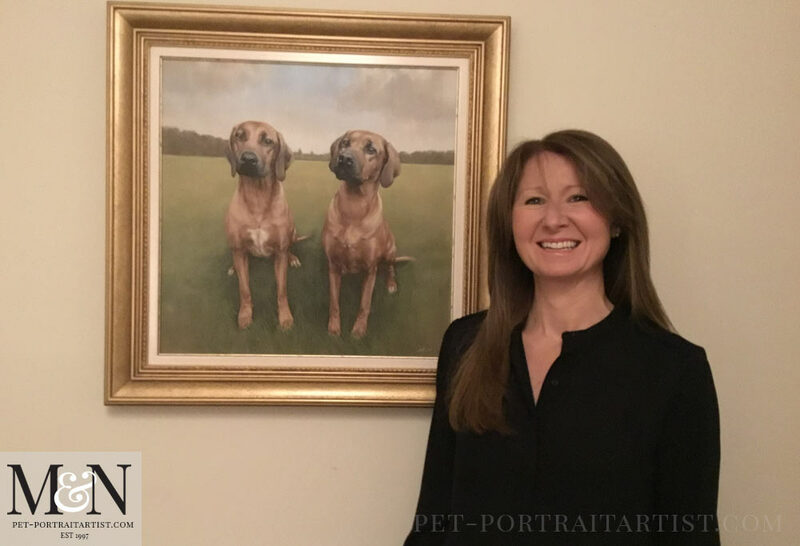 Scroll down to read amore about the stages of the Rhodesian Ridgeback Oil Painting and to see the portrait framed. 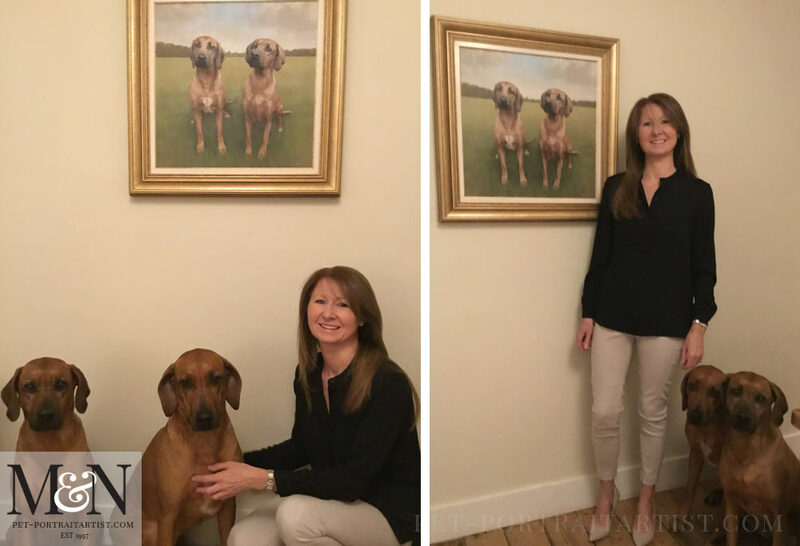 Rhodesian Ridgeback Oil Painting – Happy Clients! We are so greatful for our clients in taking photos for our website and blog! Jackie, along with Amber and Maddie posed in front of their painting and we love them! We would like to officially send much thanks to Jackie and many pats and cuddles to Amber and Maddie for being so patent on their send photoshoot of the year! (the first being photos for the portrait!). I have added a lovely email from Neil below which we hope you all enjoy reading. She took a few quick photos of it and once we were at lunch I think everybody was treated to Jackie’s story and saw the shots and I have to say everyone thought the painting was beautiful. Thank you once again, it could not have gone better. 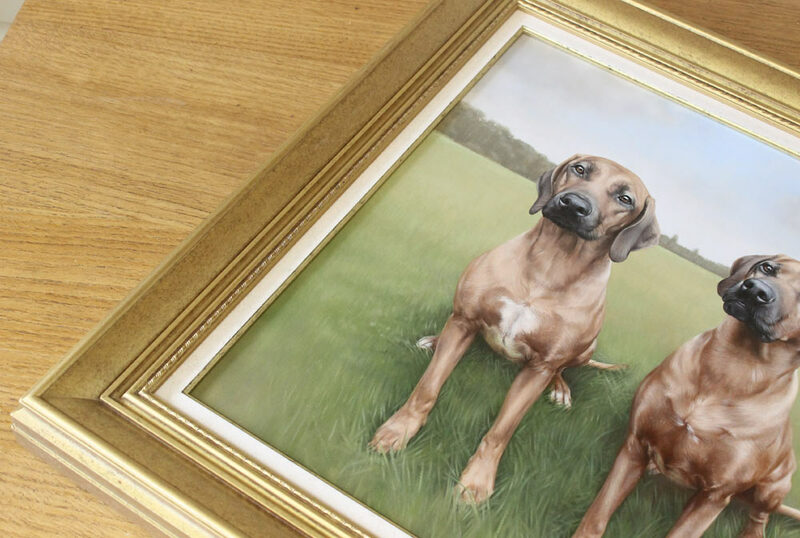 Here is the final result of the Rhodesian Ridgeback painting framed. We absolutely love this frame. It’s a brand new frame available for our clients and it is called Bayswater Gold. 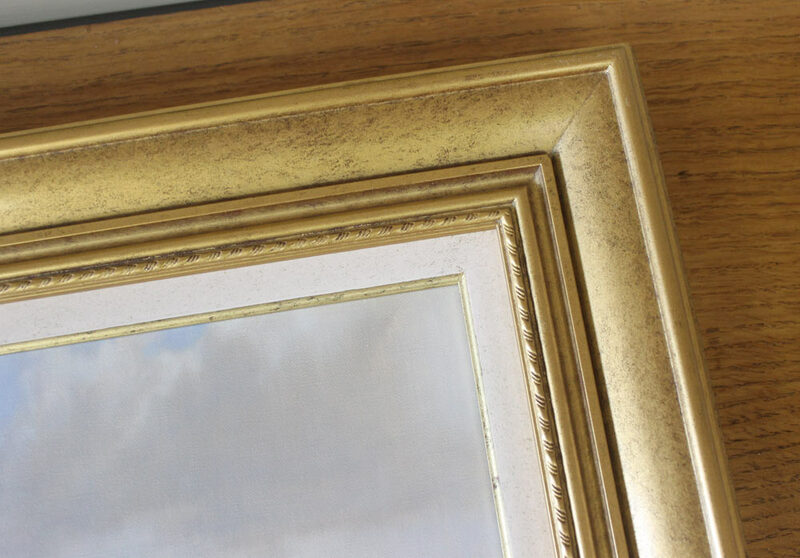 It is very similar to the Bayswater Aged frame, however where as that frame has cool blue and purple tinges, this one is a warm and slightly distressed gold. It has an inner slip in a speckled cream which has a matching gold inlay. I have added it to our framing section already for clients to view and also added the photos below. 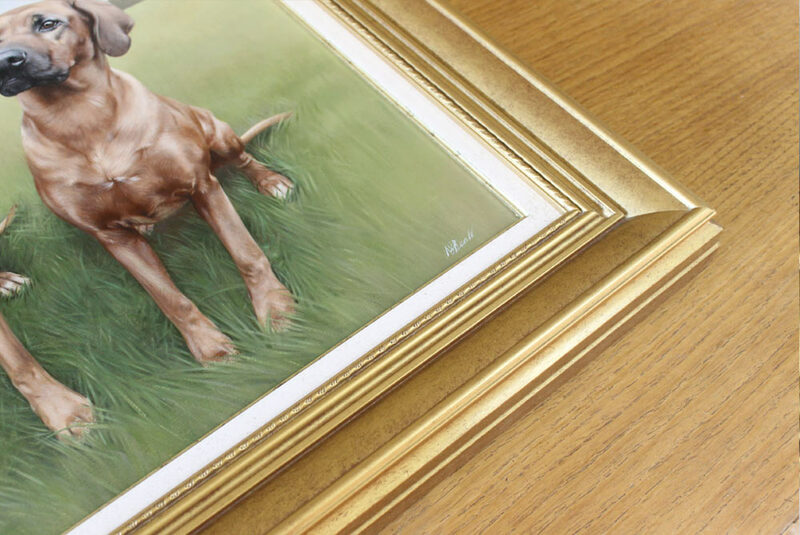 The frame really compliments the portrait well and we have found that gold in particular works well with the varying greens of the grass and beautiful blues in the sky in Nicholas’ paintings. If any of our clients are interested in having their portrait framed, they are more than welcome to email us at any time via our website or social media too. We have access to many different mouldings and will have something perfect for you and your home decor. Here is the video of Amba and Maddie! Its our first video of 2018. Funnily enough the batteries in my Gimbal were flat, probably from not being in used for a number of weeks, however luckily I had ordered a selfie stick over Christmas. It is a selfie stick which has a tripod on it and I thought it might come in handy. So I use that for this video. It obviously doesn’t have the image stabilisation but its pretty good. It has good reviews on Amazon, so a good buy! I hope you enjoy the video and we will have more blog posts coming soon so stay tuned!